How much pleasure can a Tecno Piuma bring? It is well documented that in 1964 the Pederzani brothers’ Tecno Piuma changed the course of karting forever. The dominance of the Italian made Tecno Piuma spelt the end for the US style of rear mounted, fan cooled engines on small diameter tube frames and ushered in the age of side mounted, air-cooled engines on frames made from larger diameter tube, with a completely different design and far superior handling. The Piuma’s basic design endures to this day. 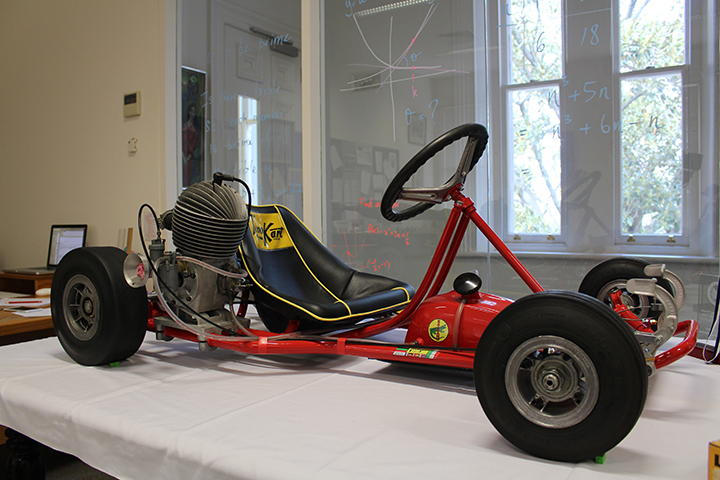 When I decided to restore a go-kart, the Tecno Piuma seemed the perfect choice, being perhaps the most notable kart ever made. From what I read, they also had a quality of personalized engineering that was well above anything of the time. So I searched for one in Australia, with absolutely zero success! The bad news for me was that in Australia, the American style of go-kart remained in mainstream use for some years after 1964. Very few European go-karts came to Australia in the 1960s, maybe due in part to very high import tariffs. A knowledgeable bloke who was active in the late 60s and 70s told of one Tecno Piuma in Australia at that time, however it has not been seen for years. So the search began overseas and after quite a while, #16 appeared for sale - in Portugal – quite a way from the land down under. We call it #16 as various parts on the kart are stamped 16, I am not sure if these are factory stampings. My first viewing of the components verified the staggering quality of the engineering, from the unique king-pins (large diameter thin-walled tubing) to the elegant two-piece rims that need not be fully removed to change tyres and of course the fact that many parts have Tecnokart proudly cast into them. #16, as best we know, spent most of its life in Portugal, racing there in the late 60s and into the 70s using a Stihl go-kart engine. After racing, #16 was owned for about 30 years by one man, who used it for recreation. In 2013 it was acquired by Alexandre Marques. It was in amazingly complete condition, a true survivor, albeit very well used! Alexandre conducted a thorough clean and tidy-up and painted it yellow. In mid 2015 #16 made the long journey to Australia. I decided to start again and restore #16 from the ground up, repairing all chassis issues and hoping I could complete a concours-quality restoration, having been inspired by the quality of restorations done in Australia by the likes of Robert Morton, Philip Parkinson, Graham Powles, Rod Williams and others. Could I do something as well as them? Many hours were spent hand stripping paint, repairing the frame’s ills, restoring the fuel tank (inside and out), repairing the original floor tray, preparing everything for paint, recreating the seat cover and its decal, recreating tank and frame stickers and so on. Then the final assembly could begin. #16 was partnered with a lovely Parilla TG14, as the Stihl engine remained in Portugal. The restoration was completed in the early hours of the morning before leaving for the 2015 Grand Nationals at Numerkah, Victoria, where #16 was first displayed. It was a great honour when it was awarded the highly coveted Jim Powles Memorial Trophy for the Best Original Restored Kart at the meeting – big smiles - and big thanks to all those who helped along the way, like Keith Hunter, Colin Moat, John Theodoridis and my family - for tolerating the final assembly process taking place in the living room. Upon returning from Numerkah there was a problem – where would #16 live? The garage? Surely not! The decision had been made not to use it on the track, at least for a while, and so it now rests in my office. Each day I gain pounds-of-pleasure admiring this beauty and thinking about the Pederzani brothers’ genius.